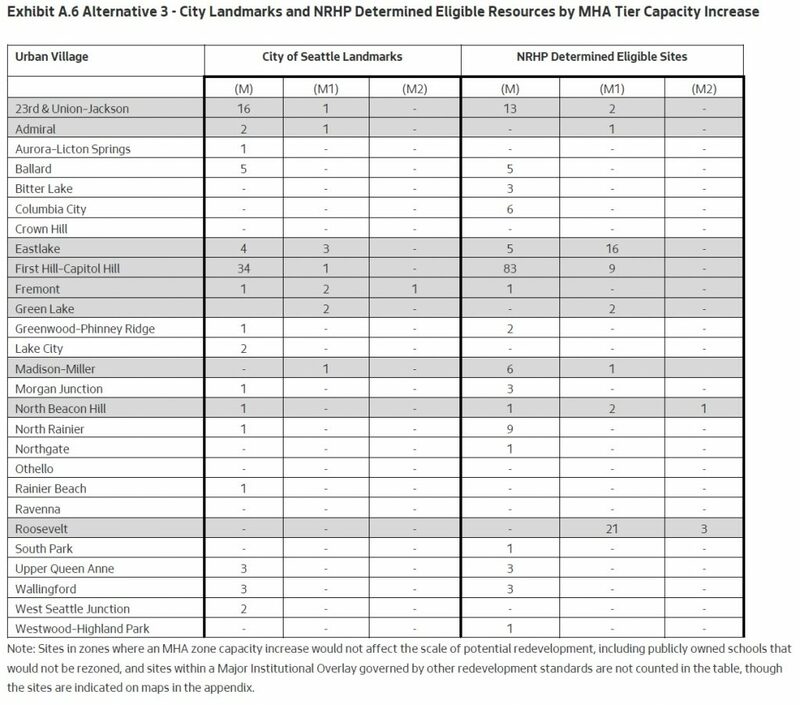 Two notable things happened today with regard to the proposed city-wide MHA “upzone” legislation: the city published the anticipated Final EIS addendum expanding on the historic resources analysis, and the City Council’s list of proposed amendments was released in advance of tomorrow’s MHA committee discussion. The Final EIS addendum on historic resources came at the direction of the Hearing Examiner’s office, essentially the only fault he found with the Final EIS that needed to be addressed. Comments will be accepted until February 22, after which one assumes that the city will address any comments and issue a “final” final version. Two new historic districts have been created since the FInal EIS was published: the Ravenna-Cowen Historic District, and the Mt. Baker Park Historic District. The total demolitions of buildings is roughly comparable in all the alternatives studied, including the total historic resources. Indirect impacts near landmarks and historic resources are expected under all alternatives. 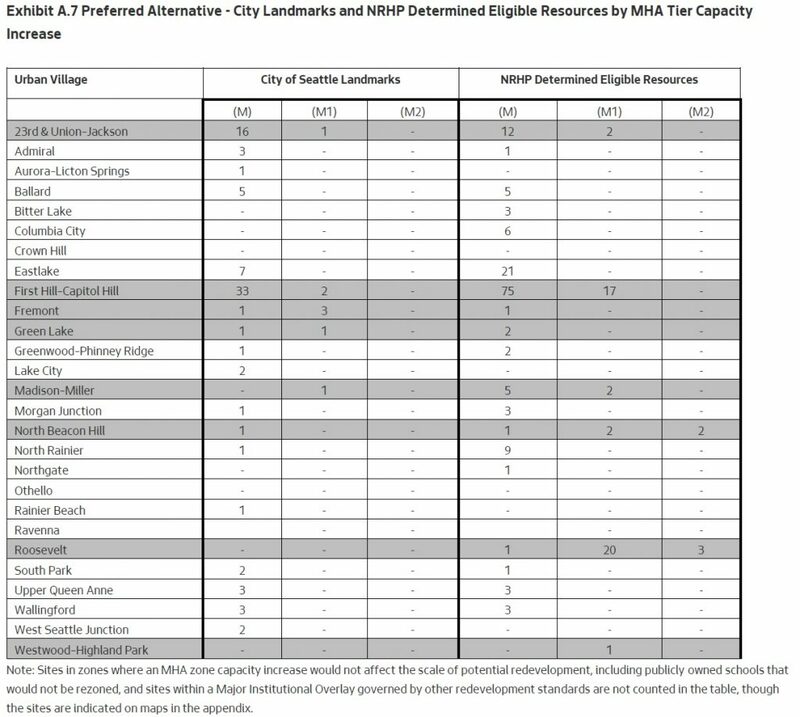 It includes tables that list, for each alternative studied, the number of historic resources in each urban village that are in locations with M/M1/M2 tiers of upzones (the higher the tier, the more generally likely of an impact). Alternative 2 has six urban villages with M1/M2 impacts; Alternative 3 has nine, and the preferred alternative has eight. You may recall the three alternatives spread upzones around the city, but did so more or less aggressively in certain areas depending on the perceived economic opportunity and displacement risk in each. It concludes that all significant impacts are potentially avoidable through a combination of mitigation measures. The list of amendments that the Council will begin discussing tomorrow (they won’t vote on them until later in the month, after a public hearing) is distilled down from a longer list of potential amendments reviewed last month. They are lovingly documented by Council Central Staff in this 179-page memo. They fall into two categories: changes to the development standards attached to zones, and changes to the land use map itself to apply different zoning to specific lots. Increasing the number of apartments that can be built on a “residential small lot” (RSL) zoned property. O’Brien proposes to change it to four; Johnson wants to remove a numeric limit altogether and let it be guided by the size of the lot (since there is a minimum size for each unit and a height limit on the property). Establishing a upper-level setback above 45 feet in height for structures abutting “The Ave” in the University District. The MHA legislation proposes to increase the height limit along The Ave to 75 feet; the setback would help to maintain the “human-scaled character” of the street. Replacing “preschool” with “child care center” in the development standards, to encourage more child care centers. The definition of “child care center” includes preschools. Increasing tree-planting regulations in RSL zones to achieve a 33% tree-canopy cover target. Creating a ne fee-in-lieu option for tree planting in RSL zones; adding protections for trees planted; and requiring arborists working with the city to be certified. Allowing off-site performance for MHA-Residential requirements, under the same conditions as the MHA-Commercial program. Waiving MHA requirements for unreinforced masonry buildings that add units and complete a seismic retrofit. 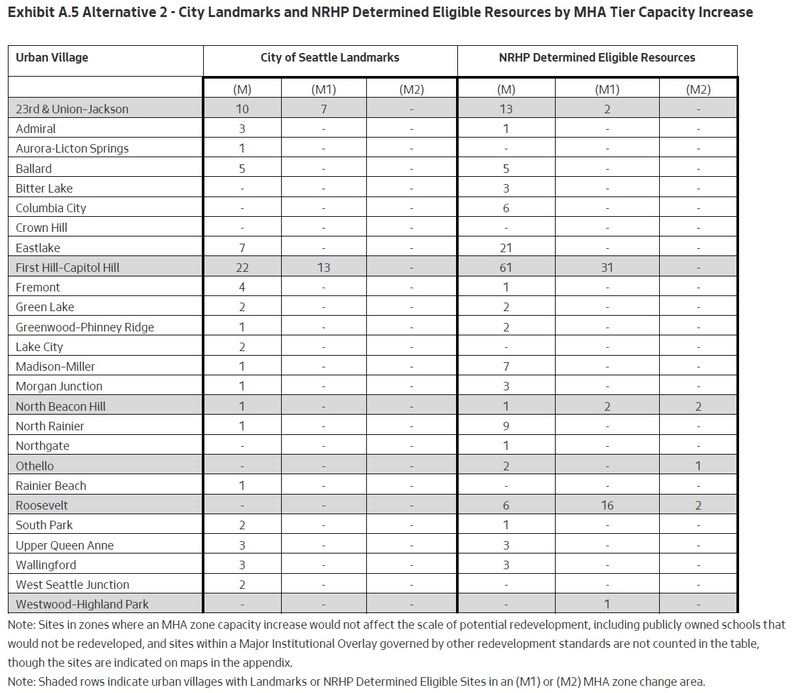 District 1: reducing upzones in the West Seattle Junction and Morgan Junction Urban Villages. Council member Herbold has previously said that she is championing this because by May the Sound Transit 3 light-rail alignment through West Seattle will have been decided; that will give them the information they need to correctly upzone the lots surrounding the planned light-rail stations. District 2: remove the newly-created Mount Maker Park Historical District from the proposed expansion of the North Rainier Urban Village. District 3: four increases: three from RSL to low-rise, and one from low-rise to mid-rise. District 4: overall, a mix of increases and decreases. Reducing part of the upzones in the upper Wallingford Urban Village from low-rise to RSL. Removing the newly-created Ravenna-Cowen Historical District from the proposed expansion of the Roosevelt Urban Village, and don’t apply MHA zoning to the parts of the historical district that are already inside the urban village boundary. District 5: adding pedestrian designations in the Aurora-Licton Springs Urban Village. Removing two mobile home parks in Bitter Lake/Haller Lake (including the Halcyon) from the MHA upzone area. District 6: Increase the upzone in the center of the Crown Hill Urban Village, and decrease it around the edges. Also, reduce the upzone near the Troll in Fremont. As the memo notes, none of the individual changes will make a significant difference to the amount of affordable housing created through the MHA program, but if they all pass, it could cause a “moderate” reduction in the overall quantity. We should get a better sense tomorrow of how much enthusiasm there is for the changes. This process provides an interesting test of the district-based Council system, especially so in an election year as Council members try to balance their commitment to maximizing the amount of affordable housing built across the city against their responsiveness to their district’s constituents. Improving tree regulations: retaining protections for exceptional trees, creating a permitting process for removal of significant trees, establishing replacement requirements, and funding enforcement. Council member Johnson has already generated several versions of a tree-protection ordinance to-date. Determining if infrastructure improvements are necessary to accommodate the anticipated growth. A number of items specific to Districts 1, 4, 6, and 7. The action begins tomorrow (Friday) morning, at 9:30. Following tomorrow’s meeting there will be a public hearing on February 21st at 5:30pm, and then the committee meets again on February 25th to vote on amendments and potentially vote the ordinance out of committee. Committee chair Rob Johnson hopes to bring the final version of the ordinance up for final approval by the full City Council at its meeting on Monday, March 18th.